Macular Degeneration is a chronic disease that affects more than 10 million people in the US and is a leading cause of vision loss in Americans over the age of 60. We have attached a PDF file of this article so that you may download and print this for family or friends that need more information. 1. What is Macular Degeneration? It is a deterioration of the central vision area (loss of pigment) in the area of the retina known as the macula. 2. What is the Macula? This is the area of the retina where we have photo-receptors that give us clear, sharp vision. 3. 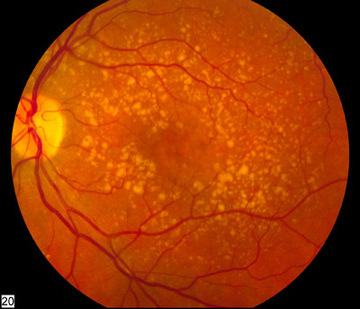 What causes Macular Degeneration? Oxidation created by a lack of chemicals that are necessary for good macular health. 5. What are the risk factors? 6. Are there tests to detect Macular Degeneration earlier now? 7. What are the two types of Macular Degeneration? b. Wet--this is the "bad boy" requiring either multiple injections in the affected eye or laser. 8. What is the best nutritional treatment for Dry Macular Degeneration? Triglyceride formula (other types of fish oil are ineffective). 9. What are some preventative measures? c. Yearly dilated examinations with special testing when necessary. e. Monitor your health--have your blood pressure, cholesterol and blood sugar evaluated often. Always feel free to contact our clinic with any additional questions!